Two-way radios has two mode of operations. They are Repeat and Simplex (also known as Talk-A-Round or Direct). Most radios are set up so that on a two channel radio, channel one is set for Repeat operations and channel 2 for simplex. When the radio (mobile or handheld) is transmitting on the repeater's input frequency, it is in Repeat Mode. You would use Repeat when you wish to contact someone but the whereabouts of that person is unknown. This enables you to extend your transmitting range by going through a repeater. Lets say that Mike wanted to contact David. 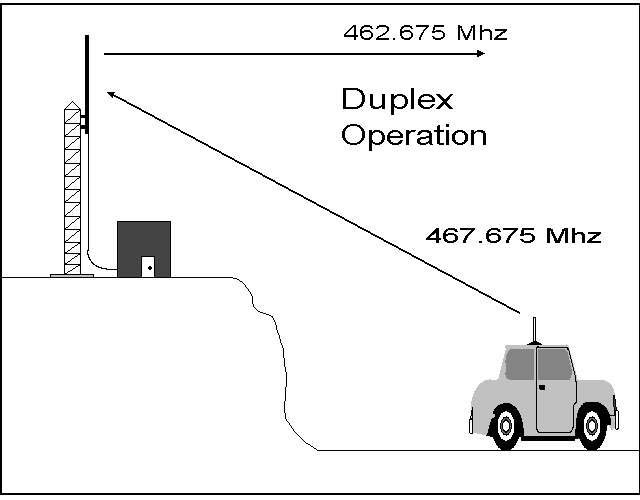 When Mike transmits on his radio, in duplex mode, he is transmitting on the repeater's input frequency, 467.675 MHz (See Figure 1). The repeater receives Mike's transmission and simultaneously re-transmits his message on 462.675 MHz. The repeater's output frequency is what all radios are set to receive. Because the repeater is at a higher elevation, he is extending his transmitting range through the use of the repeater. 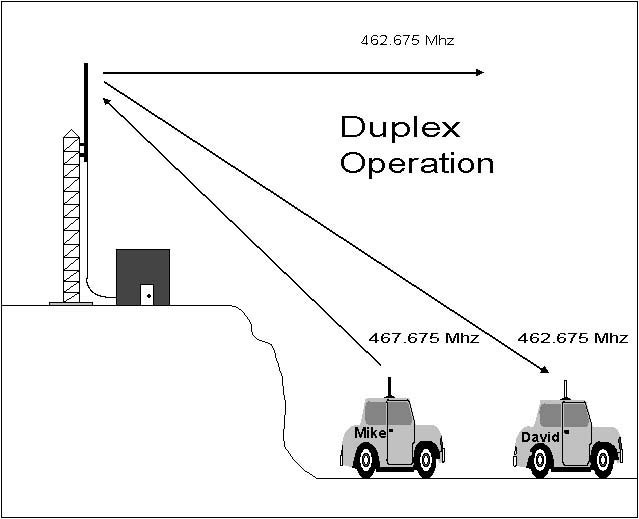 David's radio would receive Mike's transmission assuming that he is within listening range of the repeater. 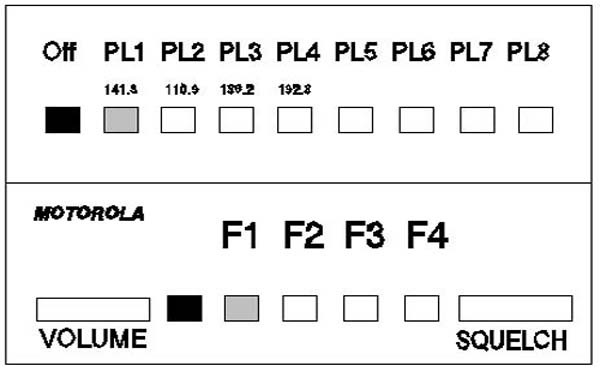 The range of a repeater depends on the elevation of the repeater site and the amount of power that is being emitted from Mike's antenna (See Figure 2). The repeater allows a mobile or handheld to transmit to the repeater and at the same time the repeater receives, it then transmits the signal at the same time much like in a telephone conversion. By going through the repeater, Mike could be in San Rafael talking to David in San Jose. Each mobile and handheld is a Half-Duplex radio. You can transmit, but you can not receive at the same time. Unlike repeat mode, simplex mode has a limit to Mike's range. A radio (mobile or handheld) is in simplex mode when the repeater is not being used. This time if Mike tries to reach David from San Rafael, David would not be able to receive his transmission since there are many obstructions between San Rafael and San Jose. The distances of Mike's transmission would depend on the surrounding environment. 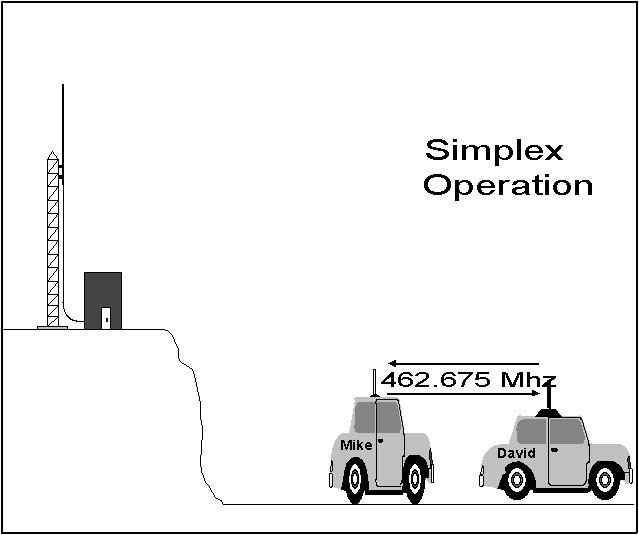 If there are tall buildings, trees or mountains between Mike's location and David's location, the obstructions would interfere with Mike's transmission. If Mike's location was in direct "line of sight" to David's location, then his transmission would have a better chance of reaching David. 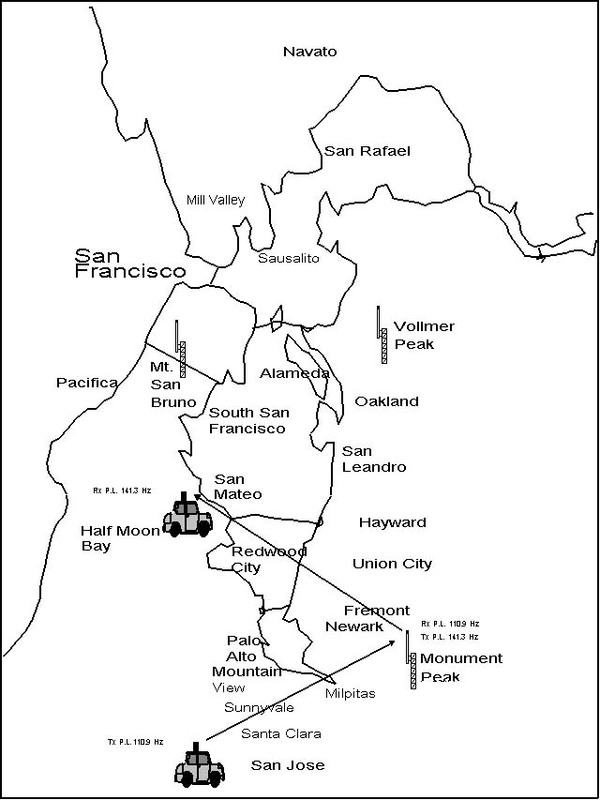 For example, if Mike was on top of Mount Diablo and David's location was in line of sight of Mount Diablo or Mike was in close proximity to David, David would have a better chance of receiving Mike's transmission since there are no obstructions between the two locations. This time Mike is transmitting on 462.675 MHz and David is receiving on same frequency (See Figure 3). Since Mike is not transmitting on the repeater's input frequency (467.675 MHz), he is depending on "line of sight" or the distance between David and him. Tone Control provides a way for radio users to monitor ONLY the transmissions with the same tone. It also provides control over their radio systems. Tone monitoring is sometimes referred to as P.L. or P.L. Mode, or Tone Squelch. When the radio is in P.L. Mode, the radio's speaker will activate only if another radio is transmitting on the same P.L. Tone. Let's say that Mike and David's radio has 141.3 Hz Tone install and both radios are in P.L. Mode. 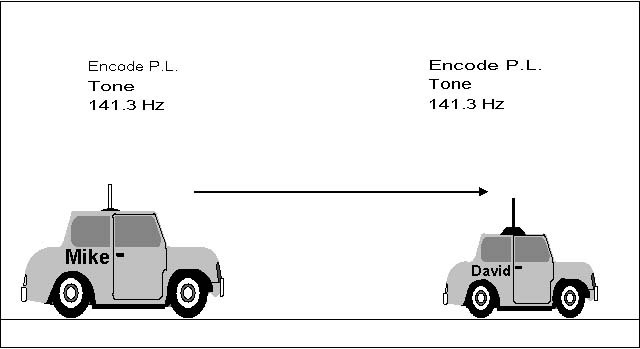 When Mike transmits on his radio to call David, Mike's transmission will be hear on David's radio since they have the same Tone (See Figure 4). However, if Sue calls Mike on the radio, and Sue has 192.8 Hz Tone, Mike will not hear her transmission while he is in P.L. Mode. Mike's radio is only receiving the tone that he has in his radio while he is in P.L. mode. If Mike turns off the Tone decoder on his radio, he would then be able to hear Sue's transmission as well as all other transmissions on the same frequency that is within his receiving range. Tone Control consists of an Encoder and a Decoder. The Tone Encoder provides the transmit tone. This is a subaudible tone that you cannot hear. The Tone Decoder, decodes the subaudible tone and then activates the receiver inside the radio. If you wish to hear all transmissions, you can turn off the radio receiver's tone decoder. Some radios may be equipped with a multiple tone encoder to be able to change the transmitting tone as needed. Tone control also provides a way to talk through one of several repeaters within the same area. By using a different tone for each repeater, you have control over each one individually, otherwise if all repeaters used the same tone you would have all the repeaters trying to transmit at the same time and you would not be able to hear anything. If Mike had P.L. 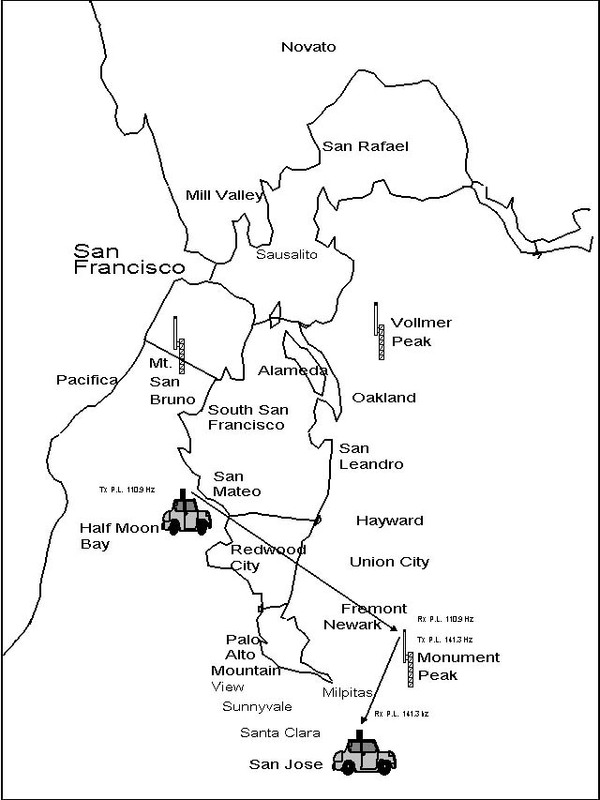 Tone 141.3 Hz in his radio, he would only be able to use the San Bruno Mountain repeater. If Mike wanted to use the San Jose repeater, he would need to have multiple tone capability. Motorola's multiple P.L. encoder board is a good example. It is equipped with four or eight tone positions (See Figure 5). If Mike had a Motorola Micor with a multiple P.L. encoder. Mike would switch to P.L. position 1, the San Bruno repeater. The type of multiple P.L. tone encoder only changes the transmit P.L.. Mike would still be listening to the same single receive P.L. tone that is installed in his radio. Today's radio allows multiple channels each with their own P.L. tone. As you change from one channel to another, the frequency and/or tone would changed based on it's programmed information. In selecting a tone, Mike is able to select which repeater to transmit through. When Mike activates the 110.9 Hz tone, he is able to talk through the Monument repeater (See Figure 6). So with multiple tone capability, Mike can switch between the two or more local repeaters. Without it, should Mike be out of range of the Monument repeater, he could only use simplex to make contact with other units. IT SHOULD BE NOTED THAT HAVING THE ABILITY TO TRANSMIT ON MORE THAN ONE TONE REQUIRES CAUTION AS YOU MAY BE TRANSMITTING ON A REPEATER THAT YOU ARE NOT AUTHORIZED TO USE. Each repeater can be activated by a different input tone, but it may have a common output tone, so that everyone may hear all transmissions no mater what repeater a person is using. 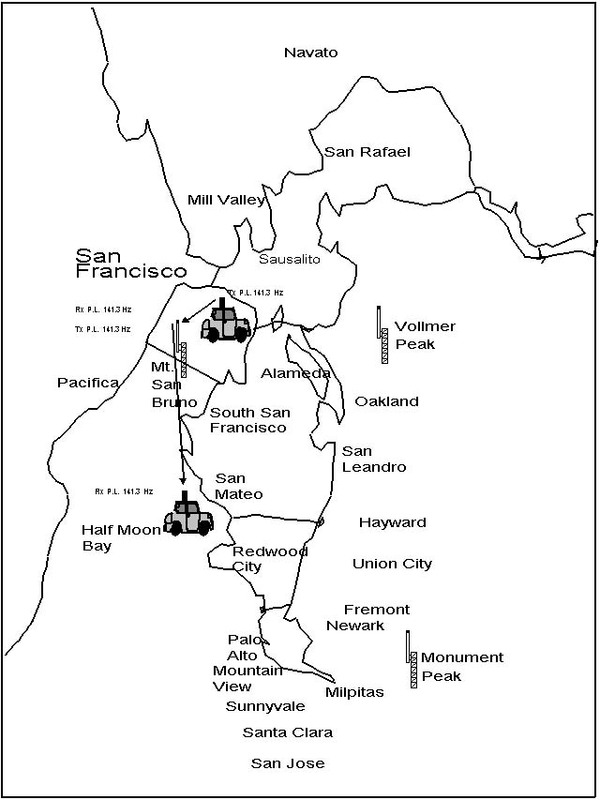 For example, if San Bruno and San Jose's repeater were transmitting on P.L. Tone 141.3 Hz, David would hear Mike's transmission whether he is in San Jose or San Francisco since both repeater's output tone are the same. The repeater's receiving tone is different that the transmitting tone. This is known as Cross P.L., or Tone Translation. Repeater #1 - (San Bruno) Golden Gate React. Input Tone 141.3 Hz used to activate the repeater. so that you can hear the repeater. *NOTE: THIS REPEATER BELONGS TO A PRIVATE PARTY AND IS AVAILABLE FOR REACT EMERGENCY USE ONLY. NO PERSONAL TRAFFIC IS AUTHORIZED WITHOUT WRITTEN CONSENT. Output Tone 141.3 Hz used by Mike to activate all tone decoders in radios with 141.3 Hz so that you can hear the repeater. The above examples are shown so that you understand that when you have your tone decoder in your radio on, you will be able to hear any repeater used at any time because all of the repeaters have a common output tone. There are 32 Standard CTCSS Tones used by most of the Radio Manufactures. Repeaters and Control Functions can also be controlled by DTMF (Dual Tone Multi-Frequency) Touch Tone. The DTMF tones can be used to control repeaters and other functions such as individual calling, turning on and off a repeater, change the operating mode of the repeater, change antennas, and turn things on and off. If you have your tone decoder on and have 141.3 Hz tone installed in your radio, you will not be able to hear BAER units as your radio is only decoding 141.3 Hz. However, if you have your tone decoder turned off, you would be able to hear them. They in turn would only be able to hear units of BAER, providing that they had all of BAER's radios were equipped with the 118.8 Hz tone and in P.L. mode. Some of today's radios allow scanning. Scanning is the process where several channels can be check to see if anyone is transmitting on any of the scanned frequencies. When the scanning process detects that a channel is receiving a transmission with the same P.L. tone, the radio will stop scanning, lock on that active channel and open up the speaker. When the transmission stops, the radio resumes scanning.